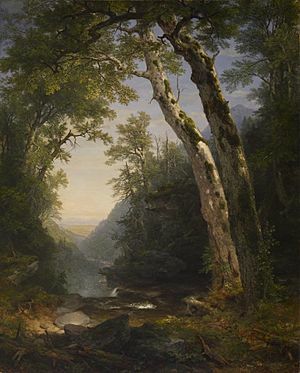 The Catskills are well known in American culture, both as the setting for many 19th-century Hudson River School paintings and as the favored destination for urban vacationers from New York City in the mid-20th century. The region's many large resorts gave countless young stand-up comedians an opportunity to hone their craft. In addition, the Catskills have long been a haven for artists, musicians, and writers, especially in and around the towns of Phoenicia and Woodstock, New York. Nicolaes Visscher I's 1656 map of New Netherland located the Landt van Kats Kill at the mouth of Catskill creek. The region to the south is identified as Hooge Landt van Esopus (High Lands of the Esopus), a reference to a local band northern Lenape Native Americans who inhabited the banks of the Hudson and hunted in the highlands along the Esopus Creek. While the meaning of the name ("cat creek" in Dutch) and the namer (early Dutch explorers) are settled matters, exactly how and why the area is named "Catskills" is a mystery. The most common, and easiest, explanation is that bobcats were seen near Catskill creek and the present-day village of Catskill, and the name followed from there. more than four decades later. Mountain lions (catamounts) were known to have been in the area when the Dutch arrived in the 17th century. It was named for Dutch poet Jacob Cats, who was also known for his real estate prowess, profiting from speculation in lands reclaimed from the sea. A ship named The Cat had gone up the Hudson shortly before the name was first used. In nautical slang of the era, cat could also mean a piece of equipment, or a particular type of small vessel, called a "catboat". It has also been suggested that it refers to lacrosse, which Dutch visitors had seen the Iroquois natives play. Kat can also refer to a tennis racket, which a lacrosse stick resembles, and the first place the Dutch saw this, further down the river in the present-day Town of Saugerties, they gave the name Kaatsbaan, for "tennis court", which is still on maps today. The Mohicans roamed the woods of New England during the 18th century. A Mohican tribe supposedly inhabited the area known as the Catskills today, led by a Mohican chief named Cat. The confusion over the exact origins of the name led over the years to variant spellings such as Kaatskill and Kaaterskill, both of which are also still used: the former in the regional magazine Kaatskill Life, the latter as the name of a clove, and waterfall. The supposed Indian name for the range, Onteora ("land in the sky"), was actually created by a white man in the mid-19th century to drum up business for a resort. It, too, persists today as the name of a school district and as the name of a Boy Scout summer camp (Onteora Scout Reservation). 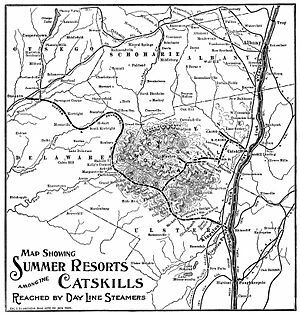 The name Catskills did not come into wide popular use for the mountains until the mid-19th century – in fact, that name was disparaged by purists as too plebeian, too reminiscent of the area's Dutch colonial past, especially since it was used by the local farming population. 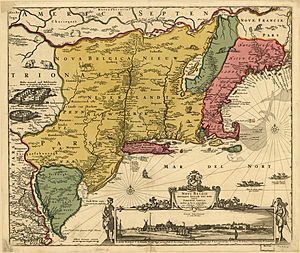 It may also have been a continuation of the British practice, after taking possession of the colony in the late 17th century, of trying to replace most Dutch Knickerbocker toponyms in present-day New York with their English alternatives. The locals preferred to call the range the Blue Mountains, to harmonize with Vermont's Green Mountains and New Hampshire's White Mountains. 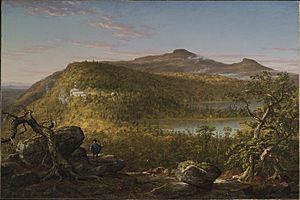 It was only after Washington Irving's stories that Catskills won out over Blue Mountains and several other competitors. At the eastern end of the range, the mountains begin quite dramatically with the Catskill Escarpment rising up suddenly from the Hudson Valley. The western boundary is far less certain, as the mountains gradually decline in height and grade into the rest of the Allegheny Plateau. Nor is there a consensus on where the Catskills end to the north or south, with it being certain only that by the time one reaches either I-88, the Delaware River, or the Shawangunk Ridge that one is no longer in the Catskills. In these peripheral regions, whether or not one is in the Catskills seems to be a matter of personal preference, as an old saying in the region seems to suggest: "When you have two rocks for every dirt, you are in the Catskills". Many visitors, including owners of weekend or vacation homes in the region, seem to consider almost anything that is west of the Hudson and sufficiently rural, yet within a short drive of New York City, to be in the Catskills. The Poconos, to the immediate southwest in Pennsylvania, are technically a continuation of the Catskills under a different name. 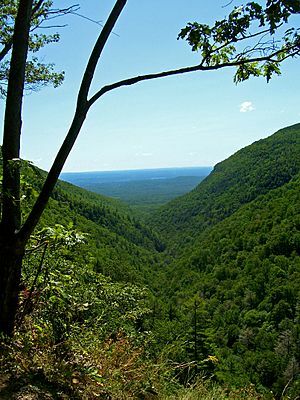 The Catskills contain more than 30 peaks above 3,500 feet (1,100 m) and parts of six important rivers. The Catskill Mountain 3500 Club is an organization whose members have climbed all the peaks in the Catskills over 3,500 feet (1,100 m). 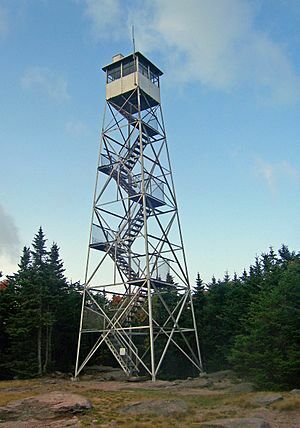 The highest mountain, Slide Mountain in Ulster County, has an elevation of 4,180 feet (1,270 m). The history of the Catskill Mountains is a geologic story come full circle, from erosion, deposition and uplift, back to erosion. The Catskill Mountains are more of a dissected plateau than a series of mountain ranges. 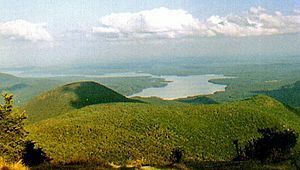 The sediments that make up the rocks in the Catskills were deposited when the ancient Acadian Mountains in the east were rising and subsequently eroding. The sediments traveled westward and formed a great delta into the sea that was in the area at that time. The escarpment of the Catskill Mountains is near the former (landward) edge of this delta, as the sediments deposited in the northeastern areas along the escarpment were deposited above sea level by moving rivers, and the Acadian Mountains were located roughly where the Taconic Mountains are located today (though significantly larger). The further west one travels, the finer becomes the sediment that was deposited, and thus the rocks change from gravel conglomerates to sandstone and shale. Even further west, these fresh water deposits intermingle with shallow marine sandstone and shale until the end, in deeper water limestone. The uplift and erosion of the Acadian Mountains was occurring during the Devonian and early Mississippian period (395 to 325 million years ago). Over that time, thousands of feet of these sediments built up, slowly moving the Devonian seashore further and further west. A meteor impact occurred in the shallow sea approximately 375 mya, creating a 10 km (6 mi) diameter crater. This crater eventually filled with sediments and became Panther Mountain through the process of uplift and erosion. By the middle of the Mississippian period, the uplift stopped, and the Acadian Mountains had been eroded so much that sediments no longer flowed across the Catskill Delta. Over time the sediments were buried by more sediments from other areas, until the original Devonian and Mississippian sediments were deeply buried and slowly became solid rock. Then the entire area experienced uplift, which caused the sedimentary rocks to begin to erode. Today, those upper sedimentary rocks have been completely removed, exposing the Devonian and Mississippian rocks. Today’s Catskills are a result of the continued erosion of these rocks, both by streams and, in the recent past, by glaciers. Platte Clove, a break in the Escarpment created by glacial action. Some traces of the most recent sedimentary layers remain for the discerning eye to discover, however. 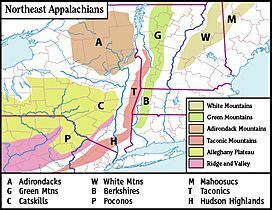 Even along the glacially-scoured eastern escarpment and in the upper Hudson Valley just below it—not to mention the glacial till-dumps and occasional terminal moraines of the southern-facing mountain slopes and valleys of the eastern and central Catskills—fragments of quartzite ranging from bright white, banded orange and tan, to deep red and dark gray are found. Many if not most of these are no more than 6 inches (15 cm) thick, have two flat sides and are without inclusions of other native rock, e.g., gray or blue sandstone ("bluestone"), most likely indicating the presence of a shallow, wave-beaten sandy delta or beach area at the base of the Acadian ranges in the delta's final stages of sedimentation. That sand layer, mostly free of silt (hence less opaque than older layers formed with higher concentrations of silt and mud under deeper water at more remote reaches of the delta) formed one or more upper layers of the delta. With compression and time, thin layers of sandstone formed of which only the here-mentioned fragments of sandstone remain now though in comparative abundance, if one measures their frequency against those of glacial erratics of similar size and shape which are typically metamorphic in origin (e.g., marble, schist, slate), which most likely originated in the geologically complex region of the Adirondacks to the north. Such sandstones and erratics are frequently found collocated in cairns and other anomalous rock arrangements of the Eastern Catskills. In successive Ice Ages, both valley and continental glaciers have widened the valleys and the notches of the Catskills and rounded the mountains. Grooves and scratches in exposed bedrock provides evidence of the great sheets of ice that once traversed through the region. Even today the erosion of the mountains continues, with the region’s rivers and streams deepening and widening the mountains’ valleys and cloves. Esopus Creek is a 65.4-mile (105.3 km) tributary of the Hudson River, starting at Winnisook Lake on Slide Mountain. It flows across Ulster County to the Hudson River at Saugerties. The Esopus is noted for making an almost 270-degree turn around Panther Mountain, following a buried 6-mile (10 km) impact crater rim. 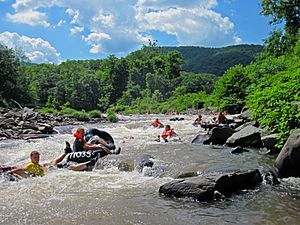 It is famous for tubing, a sport of rafting down a river in an inner tube. Many tubers begin their trip at Phoenicia, New York and head down the creek towards the Ashokan Reservoir at Olive, New York. 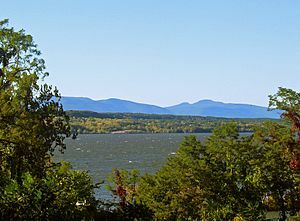 The Ashokan Reservoir is part of the New York City water supply system, fishing is allowed under permit, but swimming and most other recreational uses are forbidden. River canoeing and kayaking are popular. There are 42 kayakable rapids ranging from class I to V+. The Esopus Creek is also famous for its fly fishing, although in recent years it has been plagued by invasive plants. Another great place to fish is Roscoe, New York, also known as trout town USA. Every April 1 people flock there from all over to kick off the start of fly fishing season. 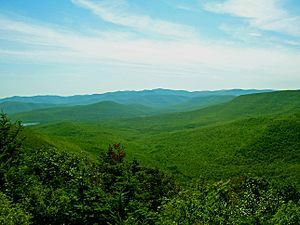 The Catskill Mountains have one of the largest and most complex natural areas in the eastern half of the United States. There are about 600,000 acres (240,000 ha) in the Catskill Park, which include many camping locations. Some notable spots to camp in the Catskills are Bear Spring Mountain, Little Pond, Mongaup Pond, and North-South Lake. Within the range is the Catskill Park, comprising over 700,000 acres (280,000 ha). Catskill Park is part of New York's Forest Preserve. Not all the land is publicly owned; about 60% remains in private hands, but new sections are added frequently. Most of the park and the preserve are within Ulster County, with a significant portion in Greene County, and parts in Sullivan and Delaware counties, too. Many of the trails in public areas are maintained and updated by the New York–New Jersey Trail Conference and the Catskill Mountain 3500 Club. Devil's Path in Greene County is one of the many trails open for hikers. 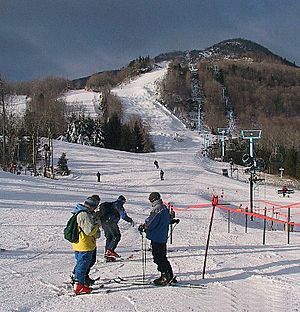 There are five main downhill ski and snowboard areas in the Catskills: Belleayre Mountain in Highmount, New York (run by the Olympic Regional Development Authority); Hunter Mountain in Hunter, New York (the first ski area to install snowmaking machines in New York); Holiday Mountain Ski and Fun in Monticello, New York; Plattekill Mountain in Roxbury, New York; and Windham Mountain in Windham, New York (which, in addition to snow boarding and skiing, is the home of the Adaptive Sports Foundation, which provides the physical and intellectually disabled with lessons on how to ski, snow tube, snowboard, bike ride, and a various amount of other types of sports). Joppenbergh Mountain, in Rosendale Village, Ulster County, New York, hosted its first ski jumping competition in 1937. Ski jumping was continued on the mountain until February 7, 1971, when the last competition was held. The Mountain Trails Cross Country Ski Center in Tannersville, New York has 22 miles (35 km) of trails. The Catskill Mountain House, built in 1824, was a famous hotel near Palenville, New York, in the Catskill Mountains overlooking the Hudson River Valley. In its prime at the turn of the century, visitors included United States Presidents Ulysses S. Grant, Chester A. Arthur and Theodore Roosevelt. 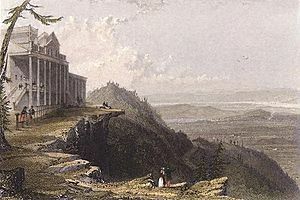 Shortly after it was completed, the Mountain House became a favorite subject for Washington Irving and artists from the new Hudson River School, most notably artists Thomas Cole and William Henry Bartlett. The Catskills are accessible by automobile from the east along Interstate 87/New York State Thruway, which runs north–south through the Hudson Valley. To the south and southwest, the Catskills are accessible by a variety of highways, including New York State Route 55, U.S. Route 44, U.S. Route 209, and New York State Route 17 (also known as "Future I-86"). Access to the western Catskills is provided by New York State Route 30; and the vaguely defined far-western edge of the region is variously considered to be New York State Route 10 or Interstate 88, though this boundary remains a matter of local preference. New York State Routes 28 and 23A cut east–west through the heart of the Catskills, serving many of the most popular outdoor tourist destinations. New York State Route 23 runs east–west across the Catskills' far-northern section. 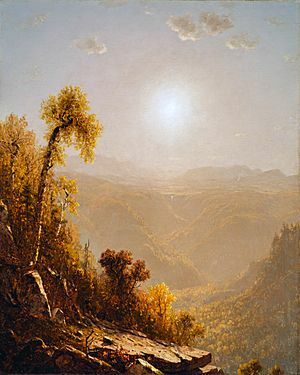 October in the Catskills, 1880 painting by Sanford Robinson Gifford. In Bill Willingham's comic book series Fables, the animals and other fairy tale characters live on "The Farm", an imaginary haven in the Catskills. The town of Bethel, New York, located in the Catskills was home to the famous Woodstock Music festival in 1969. The music festival took place from August 15 to August 18, 1969. 32 music acts performed in front of over 500,000 concert-goers. The event was captured in the documentary movie Woodstock (1970). The site is now home to the world renowned Bethel Woods Center for the Arts. Mercury Rev's song "Opus 40", on their album Deserter's Songs (1998), contains the line "Catskill mansions buried dreams/ I'm alive she cried but I don't know what it means". The band and their studios are based in the Catskills, and the area is often referred to in interview. Simple Minds filmed their video to "Alive and Kicking" (1985) here. The Catskills are mentioned in The Band's song "Time to Kill". The Band was also photographed there for their first album, Music from Big Pink, The Band in the Catskills. 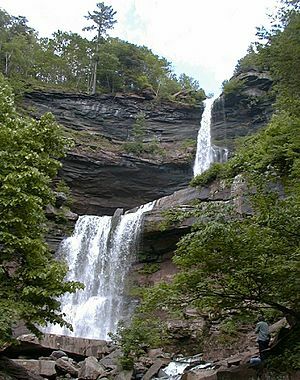 The Catskills are mentioned in the Kid Rock track "Low Life". Contains the line " I've never hung out in The Catskills, but I been to jail in Nashville". A song on Odelay by Beck is called "High 5 (Rock the Catskills.)" The many hotels and vacation resorts located in the Catskills are notable in American cultural history for their role in the development of modern stand-up comedy. Comedians such as Rodney Dangerfield, Jackie Mason, and Don Rickles and got their start performing in Catskill Hotel venues colloquially referred to as the Borscht Belt. Catskill Mountains Facts for Kids. Kiddle Encyclopedia.